PARAD (Mercury) Samagri pujan relieves from all the sufferings, problems and anxieties. PARAD (Mercury) metal (Mercury) is amongst the favourite materials of lord Shiva. It is said that the pujan of PARAD (Mercury) samagri eliminates all the evil effects of Shanis Saadhe-Saati, Dhayya and the maleficence posed by Saturn or other planets. Its pujan, darshan and sparsh brings about wonderful and amazing results. It paves the way for both the Gyan and Bhakti and reduces the effects of the evil karmas. Worship of PARAD (Mercury) Laxmi Ganesh and PARAD (Mercury) Shri Yantra is specifically beneficial to those having Cancer, Sagittarius and Capricorn rashis. Besides this it is also beneficial to the persons whose Moon and Saturn Dasha or Antardasha is running. For Success in business, for overcoming obstacles and for the gain of wealth there is a tradition in India to worship Laxmi and Ganesha together. They are worshipped especially on the auspicious occasion of Deepawali (Festival of Lights). PARAD (Mercury) Laxmi Ganesha is considered to be the most auspicious because of special spiritual significance of parad. One must worship Laxmi Ganesha for overall prosperity and elimination of poverty. It eliminates the financial sufferings and brings about progress and prosperity. It paves the way for the attainment of all sorts of worldly desires and aspirations. 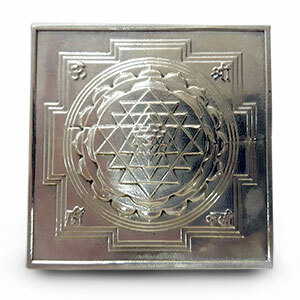 This Sriyantra made of mercury is used for increase in wealth, gain of money, success in lottery or gambling etc. This eliminates poverty and renders success to user. It also reduces bad influences of Saturn, Rahu and Ketu. PARAD (Mercury) Sriyantra can be considered most powerful and most beneficial tool for attaining all worldly pleasures and fulfilling all wishes through inner cosmic power and mental strength. PARAD (Mercury) Sriyantra is the source of supreme energy and energy is nothing but another form of element in the shape of waves and rays. It is advisable to worship PARAD (Mercury) Sri Yantra daily and regularly in shops, factories and business establishments for acquiring wealth, happiness and prosperity. It is considered a very useful and rare item and it is auspicious to keep it at the place of worship. It is a favourite element of lord Kuber and is essential while performing any worshipping ceremony or spiritual and Vedic function. Both Laxmi and Vishnu love it and keep this in their hands. Goddess Durga too holds it in her hand. Lord Krishna reverberated the whole world by blowing a conch during Mahabharata. So, wherever there is a conch Goddess Durga, Laxmi and Vishnu dwell at that place. It should be kept in every house for attaining peace of mind. By worshipping it daily ones business flourishes certainly. This Shankh is also very beneficial in correcting Vaastu doshas. 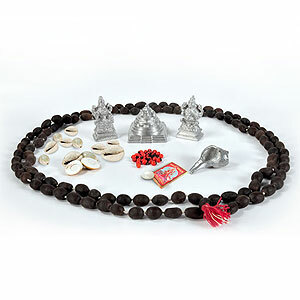 For the well-being of business ventures and commercial establishments, it is advisable to conduct daily puja with the help of the Rosary of Kamalgatta as it ensures gradual development and well-being of the business. 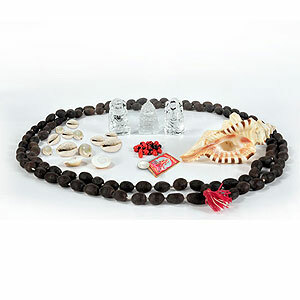 Continuous wearing of the Rosary of Kamalgatta ensures protection from black magic and witch craft and bestows upon all round development and prosperity. For the eradication of poverty and financial sufferings one should wear the Rosary of Kamalgatta and worship goddess Laxmi with this rosary. Kaudi Pujan enables one to get rid of loans. Even the lost money is recovered if one worships goddess Laxmi with Kaudis. All the desires and aspirations get fulfilled if Kaudi pujan is done in Deepawali. It is an established fact that if seven Kaudis are kept on the feet of goddess Laxmi on Deepawali and worshipped and after that these Kaudis are unearthed after mid night, it brings enormous prosperity. After the pujan, if Kaudis are kept in cash box, it attracts financial prosperity. Gomti Chakra is one of the rare, wonderful and amazing materials found out of the oceanic bed and is highly capable of wiping out all the adversities and problems in life. Gomti Chakra is very often used in remedies relating to inculcate financial prosperity. If Gomti Chakra is included in Laxmi pujan, it enables the sudden and quick inflow of money. It is advisable that after the Laxmi pujan on Deepawali day, the eleven Gomti Chakras used in pujan should be immersed into the same water with which the abhishek of Laxmi ji has been done. On next day put these Gomti Chakras in a red cloth and put it in your shop, showroom, office, factory or business ventures in any secret place so that no one could see it. If done so, it attracts immense fortune, progress and financial prosperity. Gunja is also one of the important and significant materials used in Laxmi pujan. It is a belief that if Gunja is kept in the shelf and cash box, it attracts and protects wealth. Gunja solves all the problems related to wealth and property. Gunja pujan improves the economic condition and ensures continuous inflow of money in house and business. Gunja is also able to eradicate the nazar doshas and protect from black magic and witchcraft if it is thrown in south direction after taking it seven times around the head. 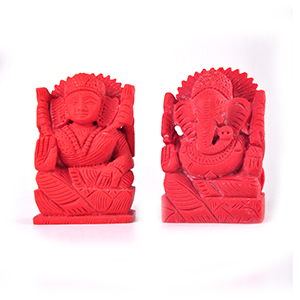 Kumkum is also an important component of Laxmi pujan. Kumkum is used for tilak during the pujan. Its tilak with the forefinger is done to the goddess Laxmi and the self. It attracts goddess Laxmijis blessings. 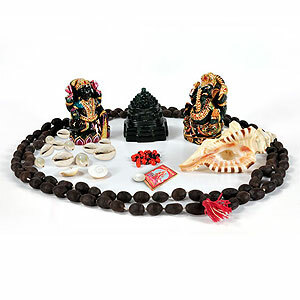 Moti is also an important component and is derived from the ocean and used in Laxmi pujan. Moti is said to be the own brother of goddess Laxmi and it also attracts wealth and financial prosperity and the blessings of the goddess Laxmi. Moti pujan bestows enormous wealth, peace, happiness, progress and prosperity and paves the way for the fulfillment of all desires and aspirations.